I can't remember where I first came across Missed Connections. Probably Fuse #8 or somewhere else equally plugged-in to the online world of quirky, whimsical, hip blogsters. Well, whoever pointed me in the right direction, many thanks! 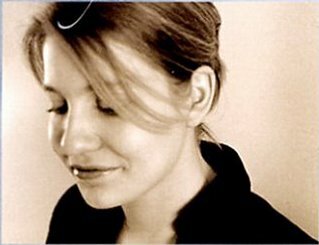 Every so often, Sophie Blackall takes a quote from a "missed connections" page on Craig's List or the like, illustrates it, and posts it on her blog, aptly titled, Missed Connections. The results are startling, witty, beautiful, and always bring a smile. 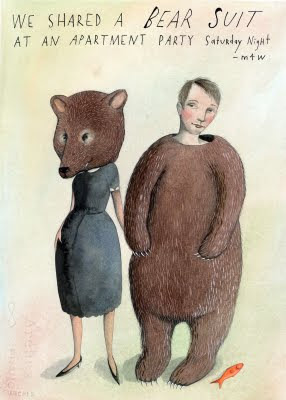 Here is one of my recent favorites: We Shared a Bear Suit (I love the addition of the fish in the bottom corner). The caption is below. We shared a bear suit at an apartment party on Saturday night. I asked for your number and you gave it to me, but somehow I don't have an area code written down. I had a great time talking with you, and I don't trust Chance enough to wait until I see you in the elevators..."